If you received the error message ‘File has already been loaded’ in transaction FEBC (program RFEBIT00), please find below an explanation of this issue and how to solve it. Please note that the program RFEBIT00 is used to create multicash files from a bank file. Normally when a bank file is uploaded in FEBC (program RFEBIT00), an entry is created in table ‘FIPYXXD_INSTMT’. When the same file is uploaded a second time, the program RFEBIT00 will check if the entry exists in table ‘FIPYXXD_INSTMT’, if yes, means that the bank file has already been processed. If the entry is already in table ‘FIPYXXD_INSTMT’, the error message ‘File has already been loaded’ will be displayed. This check ensures that the same file is not uploaded twice. This check is related to the application of the OSS note 1705402 on the system. Sometimes during uploading of the bank file (due to some wrong steps), it may happen that the file has not been uploaded successfully and the entry created in table ‘FIPYXXD_INSTMT’. This will prevent the user from uploading the file a second due to the check that will display the error message ‘File has already been loaded’. The solution is to delete the entry from table ‘FIPYXXD_INSTMT’ before trying to upload the bank file again. 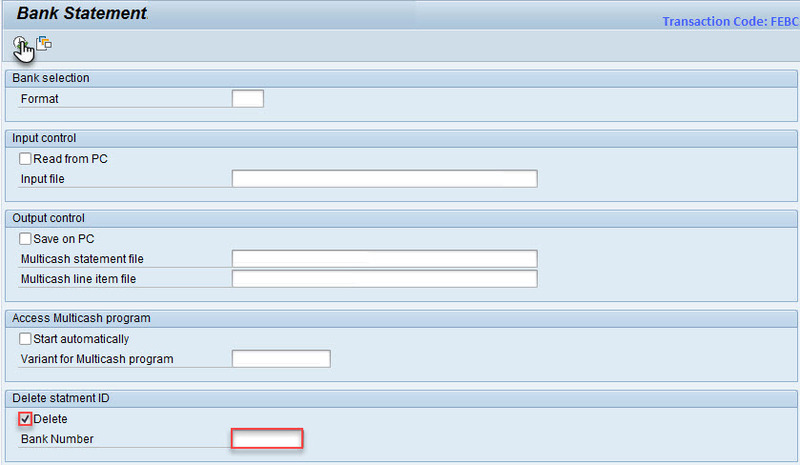 Step 1: Tick the checkbox ‘Delete’, enter the ‘Statement ID’ or ‘Bank Number’ to delete in the field ‘Bank Number’ and execute the program. This will delete the appropriate entry from table ‘FIPYXXD_INSTMT’. Step 2: Once the file has been deleted, please upload the bank file again. Please Note: When deleting entries from table FEBKO by using program ‘RFEBKA96’ it won’t delete related entries from table ‘FIPYXXD_INSTMT’.